While Spring has cloaked the Hills in a blanket of blossoms, Halloween beckons to break with seasonal cooking and indulge in some of my favourite flavours. These vegan pumpkin cupcakes are full of warm Autumnal spices and are so light and moist…I couldn’t stop at one. My daughter is super excited about Halloween this year and is fixing to dress up as either a monster mermaid or a pooh. She’s 4 and at this point it could go either way. I am, of course, campaigning for the mermaid. While she loves the idea of Halloween any actual experience she’s had with the day finds her hiding behind our legs. I bought a themed doorbell complete with booming voice and she almost dropped her cupcakes. If you’ve watched Trolls as many times as I have you’ll understand the reference. So we are giving our wee one a watered down Halloween complete with daytime pumpkin carving (she doesn’t like the dark) and an hour of trick-or-treating visiting only our four neighbours. It’s the perfect celebration for a brave-not-always-brave 4 year-old. In the last few months we’ve grappled with some big little person decisions including whether to move her forward to big school or let her enjoy another year of kindergarten. With the guidance and support of some sage souls we’ve come to this. Our Elf is 4. She’ll only be 4 once. While she is clever, articulate, curious and thoughtful she is also shy with other children and often prefers to play on her own. She follows her own heart and I love that about her. But, big school is big and she’ll need the tools to navigate that big world. Another year of kindergarten with more students than this year will give her time to develop that toolbox. Maybe next year she’ll be ready for a big scary Halloween but this year, it’s mermaids and vegan pumpkin cupcakes. Since my first trip to the States a decade ago I have been obsessed with pumpkin spice. Besides an unfortunate pumpkin latte incident (are they supposed to be that thick?) pumpkin spice has sat right up there with peanut butter and chocolate as my favourite sweet flavour combination. 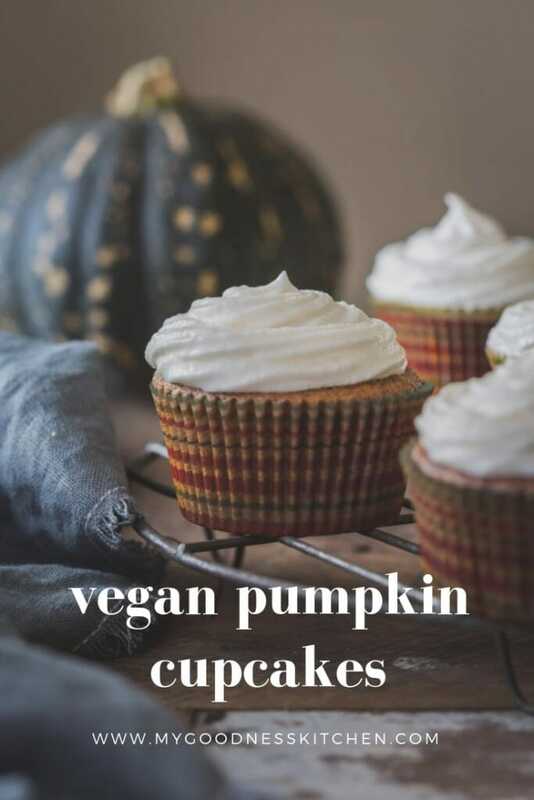 With those familiar cinnamon, nutmeg and clove aromas my spellbinding vegan pumpkin cupcakes put me right back in to my happy place. I am not a baker. I am what you would call an enthusiastic novice. Any baking recipes on this blog have been tested and tested and tested. So, you’ll be happy to know that if baking is not your strong point, you can still make these cupcakes. I will not ask you to cream or sift or weigh; all you need is two bowls, a whisk and your oven. A cupcake pan will come in handy too. Simples. For my daughter I topped these little cakes with a basic sweet frosting inspired by a recipe I came across on Loving It Vegan (if you love sweets check out Alison’s blog, it’s wonderful). For something a little less sweet you could try a simple cashew frosting or mix it up with something chocolate. They are also pretty wonderful with a simple dusting of confectioner’s sugar. 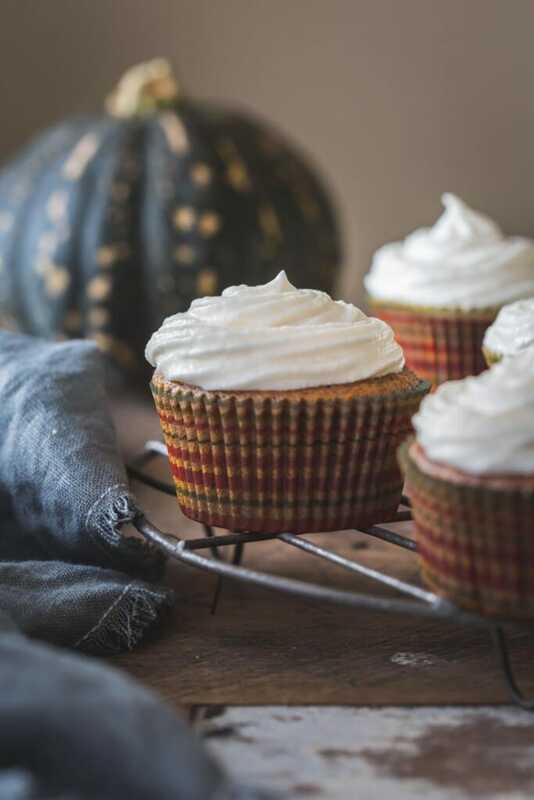 However you enjoy them these aromatic and wonderfully light pumpkin cupcakes are the perfect little Halloween sweet for big and small people. Nothing scary, nothing spooky but perfect for a little person being a little person the only way she knows how. Enjoy, x. If you try this dish, please let me know! Leave a comment, rate it, and don’t forget to tag a photo #mygoodnesskitchen on Instagram. I’d love to see what you come up with. I hope you love these cupcakes as much as I do ! Cheers, friends. 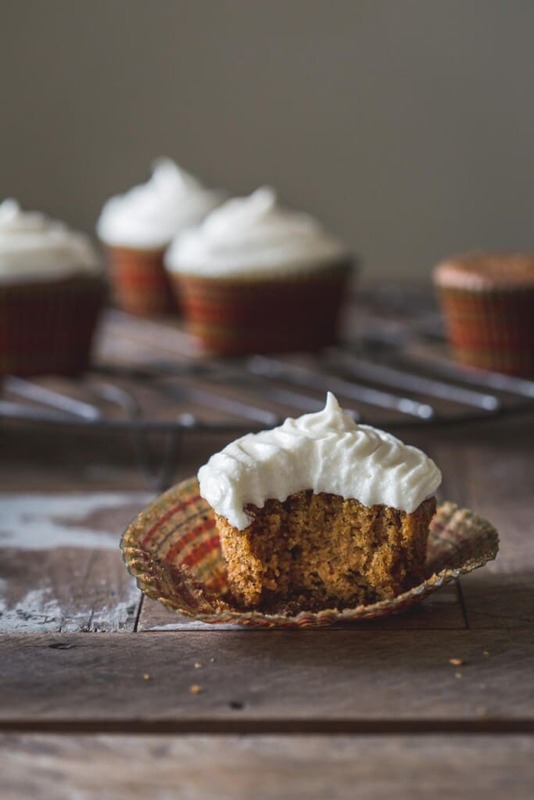 These vegan pumpkin cupcakes are full of warm Autumnal spices and are so light and moist you won't be able to stop at one. Pre-heat oven to 170 degrees C (340 degrees F) and line a 12-pan cupcake/muffin pan with cupcake sheets. In a medium mixing bowl whisk together the flour, baking powder, baking soda, sea salt, cinnamon, nutmeg and cloves. In a separate larger bowl, whisk together the pureed pumpkin, sugars, aquafaba and sunflower oil. Add the dry ingredients to the wet and whisk together until combined. Don't over mix; stop when the lumps are gone. Fill each cupcake pan just over half-full with the cake batter and bake in the oven for 18 - 20 minutes or until a skewer comes away clean from the centre of a cake. Remove the cakes from the oven to cool completely before frosting. To prepare the frosting add the ingredients to a large bowl and beat together with an electric beater until soft peaks. Pipe on to cooled cupcakes to serve. Store in an airtight container for up to four days. For this recipe I used fresh steamed pumpkin (Kent) which I pureed in a food processor with a little water until smooth and silky. I made these for my family the other night, they did go down a treat, i had to sneak away a few for myself, i did forget about them until last night, i noticed they were sooooo fresh 2 days later, it was if i had just baked them, very delicious too, the family a big thumbs up..well done..they are amazing..
YUM! These cupcakes look so delicious and perfect for Fall. Oh, thanks Natalie! I just checked out your blog. So many delicious baked goodies.